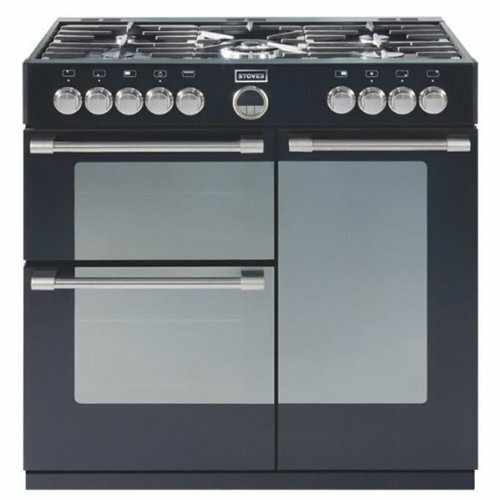 This stylish Cooker from Stoves which is part of the Belling group is a dual fuel cooker that gives you the control of a gas hob with the added benefits of the temperature distribution of an electric fan oven. This cooker boasts 5 burners including a wok burner that provides intense burning, and has cast iron pan supports and also includes a removable griddle plate. The electric oven is multifunctional, providing 9 functions such as fan, intensive bake, defrost and pizza settings.The ST900DFT also includes a separate electric grill, with all these features at your disposal it should make cooking easier and with better results.